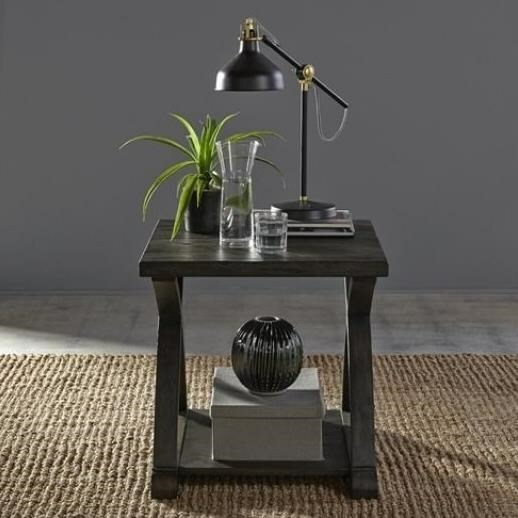 Add some lived in rustic charm to your living room with this stylish end table. The Twin Oaks Rustic End Table with Bottom Shelf by Liberty Furniture at Miskelly Furniture in the Jackson, Pearl, Madison, Ridgeland, Flowood Mississippi area. Product availability may vary. Contact us for the most current availability on this product. Enhance the lived in rustic style of your home with a selection from this attractive group of occasional tables. Stylish yet practical, the extra storage and functionality offered by each piece in this group is exactly what your living room has been needing. The Twin Oaks collection is a great option if you are looking for Rustic furniture in the Jackson, Pearl, Madison, Ridgeland, Flowood Mississippi area. Browse other items in the Twin Oaks collection from Miskelly Furniture in the Jackson, Pearl, Madison, Ridgeland, Flowood Mississippi area.